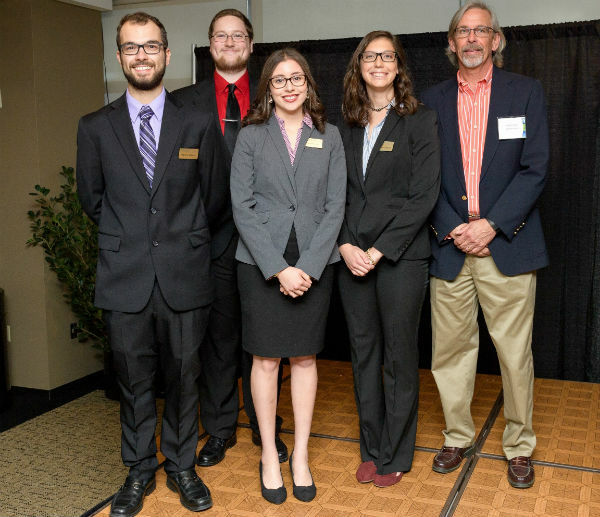 As part of the EEE Recognition Night, undergraduate student senior design posters were judged for the title “Best Senior Design Poster”. The winning team was based upon the three EEE faculty member judges review of the posters prior to the event and team member performance at Recognition Night. This year there was a tie and both the General Motors and Ramboll Environ projects won the title. The General Motors team entitled their poster “GM Steam Heating System Replacement for Improved Efficiency and Associated Environmental and Economic Costs Reduction”. 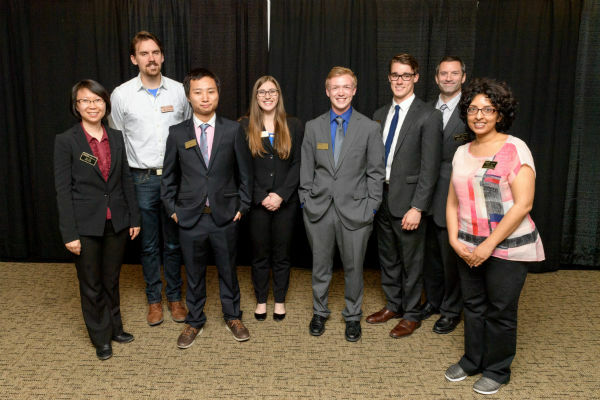 Pictured below (from left to right) is the General Motors senior design team with EEE faculty judges Hua Cai and Brady Hardiman; team members Haitian Liu, Ashley Devore, Daniel Franz, and Ben Spurgeon; their sponsor representative Rob Threlkeld, GM Global Manager-Renewable Energy; and EEE faculty judge Amisha Shah. The Ramboll Environ poster title was “Integrated Streambank Stabilization and Habitat Restoration on the Lower Rouge River Old Channel”. The Ramboll Environ senior design team are presented below with their sponsor. Shown from left to right are team members Franklin Wagner, Eric Pluard, Lena Abu-Ali, and Leanna Canyon with sponsor representative Greg Gillespie, Principal Consultant (retired) for Ramboll Environ. Winning team members each received a gift card for their efforts.